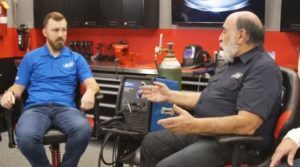 The Society of Collision Repair Specialists announced Thursday it’d released Part 2 of a trilogy of videos on MIG and MAG welding. The video is the latest in a free YouTube series featuring informal panels of shop owners and other experts discussing both hot and potentially overlooked technical aspects of collision repair. The video collection provides a great educational resource for not only technicians and shop owners but also educators, insurers and vehicle owners. The film features SCRS board members Dave Gruskos (Reliable Automotive Equipment) and Michael Bradshaw (K&M Collision), former board Chairman Andy Dingman (Dingman’s Collision Center), and SCRS Education Committee co-Chairman Toby Chess (Kent Automotive). SCRS announced Part 1 last month. It discusses the types of MIG welders available for shops, considerations before buying one, and how to ensure your shop has the correct wiring and voltage to use the new toy on a steel or aluminum vehicle. “If you are looking to update the welding equipment in your facility, or fine tune your approach to proper repairs, this new series should inspire questions and considerations as they relate to the equipment, facility, procedures, training, protective measures and more,” SCRS wrote in a news release. The MIG/MAG series should be particularly valuable to shops preparing for the I-CAR welding certification tests needed to retain a spot on State Farm’s Select Service direct repair program or to join an OEM network. I-CAR tests not only the technician, but the shop itself — a facility must have the proper equipment and infrastructure before I-CAR will even let techs take the exam. The discussion in Part 2 even mentions elements of the welding program a few times. Featured image: SCRS board member Michael Bradshaw (K&M Collision), left, and SCRS Education Committee co-Chairman Toby Chess (Kent Automotive) are shown in an Society of Collision Repair Specialists video on MIG and MAG welding.